It was the heady days of the early 1900s, and radiation was all the rage. Researchers had just found a kind of radiation called "beta decay," and they discovered that it did something that seemed to smash one of the basic tenets of physics. Here's how the lowly neutrino saved the entire field. At the turn of the last century, the Curies came up with the term "radiation" as a description of the recently-discovered becquerel rays. The idea came to encompass a lot of strange phenomena, including the sudden emergence of a helium nucleus from a uranium atom and some very odd things called "beta rays." Beta rays, scientists came to discover, were nothing more than electrons. Mystery solved! And new mystery discovered. Electrons did consistently come out of a nucleus, but they didn't come out at the same energy level each time. There was a ceiling to the energy at which the electron could shoot out of a nucleus, but not a floor, so many electron ejections seemed to be missing energy. There was nothing, nothing whatsoever, to indicate where that missing energy was going. Scientists had clued in to the fact that beta rays consisted of electrons, because researchers could measure negative charge. This "missing" energy wasn't linked to any detectable charge. At that time, neutrons hadn't been discovered yet, so a neutral particle wasn't considered an option. Even if scientists had known about neutrons, the missing energy didn't come with anywhere near a neutron's worth of mass. This led to no less a scientist to Niels Bohr speculating that the conservation of energy, one of the basic tenets of science, just didn't apply to subatomic particles. That was an understandable assumption. Conservation of energy wasn't verifiable as a universal law. Yes, it seemed to hold true for much of the science so far, and it was a very helpful assumption which seemed to clarify a lot of problems. But if it didn't clarify this one, why not chuck it out? Because of Enrico Fermi and Wolfgang Pauli, that's why. Pauli wrote to Bohr, saying, "What if someone owed you a great deal of money, and offered to pay it back in installments, but each time the agree-upon installment was not met? ... Would you consider that something was missing?" Pauli came up with the idea of a neutral particle with less mass than any particle yet discovered. Fermi liked the concept, but was lost until he got an assist from another physicist, who discovered a new particle — the chargeless neutron — sitting in the nucleus. Fermi posited that beta radiation shoots out when a neutron changes to a proton. The neutron ejects an electron, which balances the charge, and a neutrino, which balances the mass and energy. 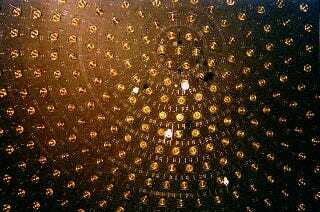 It took decades for neutrinos to be observed. But on paper, at least, they had been detected. Fermi and Pauli are now credited with the discovery that didn't just advance physics, but saved the first law of thermodynamics. Image: Fred Ullrich, Neutrino Discovery Event: Argonne National Laboratory.